Rohit and Sheena both glowed as they prepared for their wedding. 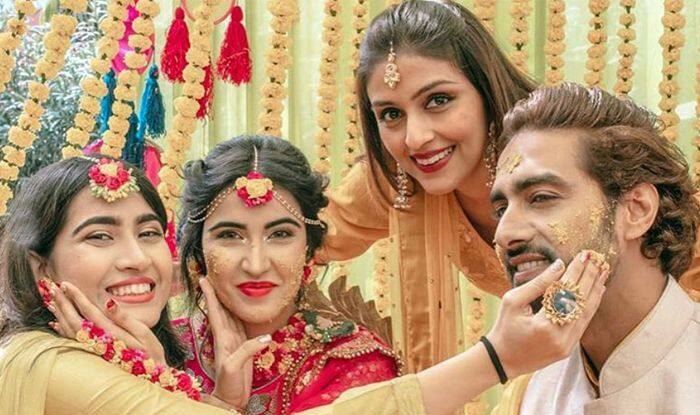 Television actors Rohit Purohit and Sheena Bajaj are all set to tie the knot, and ahead of the nuptials, the couple was pictured going through the pre-wedding festivities with their families and friends. The two have been in a relationship for a long time, dating one another since the time they began working together in 2012 crime-fiction TV series Arjun. The pre-wedding festivities began with the haldi ceremony, and it was then followed with the sangeet, mehendi, shagun and ring ceremonies. Sheena, who shared the pictures on her Instagram page, looked absolutely radiant in a magenta and yellow lehenga, while Rohit looked equally smart in a yellow kurta and off-white pyjamas. Check the pictures out. The marriage will take place today, January 22, and from pictures, their friends like Aniruddh Dave, Saurabh Pandey and Mohit Daga could be seen in attendance. Sheena on the other hand, is well known for her portrayal of Dolly Singh in Disney Channel India sitcom Best of Luck Nikki, which is an Indian adaptation of the American show Good Luck Charlie. Apart from that she also starred in Thapki Pyar Ki, Khatmal E Ishq and Mariam Khan – Reporting Live.